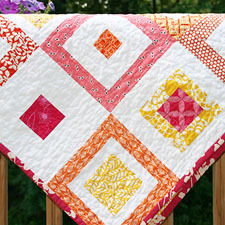 Faith Jones blogs at Fresh Lemons Quilts. She began early 2009 and has explored all aspects of the art, from fabric design to pattern creation. 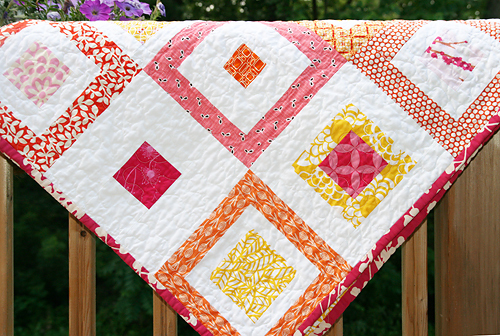 Faith's patterns can be found in Modern Blocks : 99 Blocks from Your Favorite Designers, Fat Quarterly, and Quiltmaker. Faith is an active member of the Flickr community, enjoys sharing tutorials and hosting quilt-alongs on her blog, and participating in quilting bees and swaps. She has a wonderfully supportive husband and is blessed with two young children. The Lemon Squares Quilt Pattern is a squares-in-squares quilt that is made out of only 6 types of blocks. I chose to make this quilt look scrappy by using a wide variety of fabric from my stash. You could also use solids and have a classic, cleaner look. I used 5 sets of fabric colors for my quilt and that is reflected in the mockup: Light pink, dark pink, light orange, dark orange, and yellow. Enjoy! Finished Size: 62" x 72"